Guest blog by Chris Van Beke, co-founder of Vendor Registry. Launch Tennessee’s master accelerator program, The TENN, took 10 startup companies –- including my company, Vendor Registry –- to Silicon Valley this week. We have spent the week networking with entrepreneurs, investors and media and working from some of San Francisco’s co-working spaces and accelerators. It has been a great opportunity for me and other Vendor Registry co-founder, Brian Strong, to talk about our company to a new set of people. We’ve connected with many of the incredible startup folks in Knoxville and throughout Tennessee, but this trip has introduced us to California-based investors and entrepreneurs that we would have been hard-pressed to meet on our own. This week’s learning events gave us the chance to see the headquarters of Google and Intuit, as well as Microsoft’s Silicon Valley office. We received valuable advice on a variety of topics, but these events also introduced us to more people than we could have ever imagined. We made great contacts through the events Launch Tennessee set up and by working on our own during our free time. The startup culture in San Francisco is obviously different than Tennessee’s. We have had a great time experiencing the energy that can be found everywhere from co-working spaces and accelerators to coffee shops. We also learned a lot about Tennessee’s strengths in entrepreneurship. The feedback we have received this week definitely shines a light on our great state and the bright future ahead. I think we are all leaving San Francisco feeling validated by our conversations and confident that we can bring a flavor of that startup culture back to Tennessee. Launch Tennessee is a public-private partnership focused on supporting the development of high-growth companies in the state of Tennessee with the ultimate goal of fostering job creation and economic growth. Brock can be reached at charlie@launchtn.org or @cebrock on Twitter. This entry was posted in Start-ups and tagged Brian Strong, Chris Van Beke, entrepreneurs, investors, Launch Tennessee, Silicon Valley, startup, The TENN, Vendor Registry on November 8, 2013 by Roger Harris. Guest blog by Charlie Brock, CEO of Launch Tennessee. We’re more than halfway through our California trip with The TENN, and so far, The TENN founders have networked with Silicon Valley entrepreneurs, investors and media. They’ve also had a chance to check out some of San Francisco’s co-working spaces and the headquarters of Google. Thursday The TENN founders had a chance to visit Microsoft and meet with their venture capital arm, Microsoft Ventures. They talked to several Microsoft domain experts, who gave The TENN more information about their various services for entrepreneurs. Thursday night, we will attend a learning event at Intuit’s headquarters in Mountain View. Intuit has several big-name brands, including QuickBooks, TurboTax and Quicken. The expert for tonight’s learning event is author, educator and entrepreneur Nir Eyal. Nir writes for his personal blog, NirAndFar.com, and is also a contributor to Forbes, TechCrunch and Psychology Today, where he covers the intersection of psychology, technology and business. He has had two successful startups: Sunshine Business Development, which sold in 2007, and AdNectar, which sold in 2011. During their free time, The TENN founders worked from NestGSV, an accelerator in Redwood City. This was especially exciting because one of the The TENN companies, Nashville-based Gun.io, is working from NestGSV this fall. It was a great opportunity for Gun.io Founder and CEO Teja Yenamandra to show off his digs to the other participants of The TENN.
We’ll be back with one more post about our last day in California before The TENN returns to Tennessee. This entry was posted in Start-ups and tagged Charlie Brock, Google, Intuit, Launch Tennessee, Microsoft, NestGSV, Silicon Valley, startup, The TENN on November 8, 2013 by Roger Harris. As you may have read in my posts earlier this week, Launch Tennessee has taken The TENN – our inaugural master accelerator program for 10 of Tennessee’s top startups – to California this week to network with entrepreneurs, investors and media. It’s already been a busy week. The TENN founders have visited two San Francisco co-working spaces and had a tour and meeting at Google. Wednesday, we gave the teams a chance to experience San Francisco on their own with a free day for them to set up networking meetings with investors, entrepreneurs and thought leaders in Silicon Valley – a chance to begin fostering relationships that could prove very valuable in the coming months and years. Wednesday night The TENN teams will reunite at Barrel House, an invitation-only venue catering to the creative community, for “Southland in San Francisco,” which will bring together Silicon Valley investors, entrepreneurs and tech media for a Southern-flavored event celebrating a great year in Tennessee entrepreneurship, as well as the recent announcement about Southland 2014. Complete with BBQ and Tennessee whiskey, this is the perfect chance for The TENN founders to show some of San Francisco’s startup leaders what Tennessee is doing. This entry was posted in Start-ups and tagged Barrell House, Charlie Brock, Launch Tennessee, San Francisco, Silicon Valley, Startups, The TENN on November 7, 2013 by Roger Harris. Guest blogger Charlie Brock’s latest report from Launch Tennessee’s California tour. Monday was the first day of a pilgrimage to Silicon Valley by 10 of Tennessee’s most promising startups, i.e., The TENN from Launch Tennessee. It was a great introduction to the center of the technology universe for our startup founders, and today we stepped it up with a tour and meeting at Google – which, once upon a time, was also a startup. Our teams had an exciting time exploring “the Googleplex” – the official moniker for Google’s Mountain View, Calif., headquarters – and talking with the people behind the world’s most successful search engine. After the tour, The TENN had a meeting with the Google’s marketing and cloud teams. We were immersed in all things Google including topics such as cloud computing, AdWords and the future of mobile. One important takeaway we all received was a charge to identify interesting problems and find an interesting way to solve them. Tonight (Tuesday), the teams are going to the NODE+ Forum kickoff party at RocketSpace – an open innovation facility for tech companies in San Francisco. Tonight’s kickoff event celebrates the launch of NODE+ Forum 2013, the world’s first online conversation portal, where anyone can collaborate on developing the future of wireless sensor platforms for smart devices using Google+ Hangouts and xTV. We’re especially excited about this event because it gives us the chance to introduce The TENN principals to the founders of an exciting Tennessee startup that won Launch Tennessee’s first Southland conference in June. Node is a product of Variable, Inc., a Chattanooga-based startup. Variable, Inc. has already done some amazing things since Southland, and this event is a perfect chance for The TENN to see what is possible for Tennessee startups. Vendor Registry, one of the Knoxville-based startups in The TENN, was also invited to exhibit at Southland. The TENN is providing more networking opportunities for Vendor Registry and the rest of the founders of The TENN, both in Tennessee and in California. Charlie Brock is CEO of Launch Tennessee, a public-private partnership focused on supporting the development of high-growth companies in the state of Tennessee with the ultimate goal of fostering job creation and economic growth. Brock can be reached at charlie@launchtn.org or @cebrock on Twitter. This entry was posted in Start-ups and tagged AdWords, Charlie Brock, cloud computing, Google, Googleplex, Launch Tennessee, Silicon Valley, The TENN, Vendor Registry on November 6, 2013 by Roger Harris. This week, Launch Tennessee is taking the principals of 10 of Tennessee’s most promising startups – also known as The TENN – to Silicon Valley to meet investors, entrepreneurs and tech media. Launch Tennessee created The TENN as a master accelerator program to help startup companies that graduated from one of Tennessee’s nine accelerator programs, but still need stage two support. Two local startups are participating in The TENN: Vendor Registry and Survature. Vendor Registry (www.vendorregistry.com) makes local government contracting easier by standardizing and centralizing online vendor registration and bid notifications. Survature (www.survature.com) provides fresh, engaging and interactive surveys that result in more insightful reports into respondents’ behaviors. In addition to meeting some key entrepreneurship players this week, The TENN will get the chance to experience Silicon Valley’s startup scene and bring some of that energy and knowledge back to Tennessee. The TENN is working this week out of Bloodhound Headquarters – a co-working space in San Francisco. The space is open and creative with a tranquil outdoor courtyard, allowing The TENN companies to get a feel for the San Francisco startup culture. 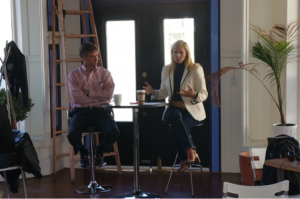 Monday, we started with a Q&A with Launch Tennessee board member Marci Harris, CEO of POPVOX, a government communications startup. Marci gave the group some outstanding real-life startup advice and answered The TENN’s questions about investment opportunities, the Silicon Valley startup culture and the importance of thinking about how big your idea can be. We headed to Hattery for lunch. Hattery is a startup incubator and education and events space in the SoMa district of San Francisco. It’s another one of San Francisco’s co-working spaces, and it was a great opportunity for The TENN companies to meet more Silicon Valley entrepreneurs and get another dose of the local startup environment. We have a lot planned for The TENN this week, including formal meetings and free time for The TENN principals to do their own networking. Launch Tennessee is a public-private partnership focused on supporting the development of high-growth companies in the state of Tennessee with the ultimate goal of fostering job creation and economic growth. This entry was posted in Start-ups and tagged Bloodhound, Charlie Brock, Hattery, investors, Launch Tennessee, Marci harris, POPVOX, Silicon Valley, startup, Survature, The TENN, Vendor Registry on November 5, 2013 by Roger Harris. An interesting mix of potential businesses will compete May 11 in the finals of this year’s Start-up Business Plan Competition, The Development Corporation of Knox County said today. The top two picks by a panel of judges will get free office space, cash and other goodies. The finals will be held at 1:30 p.m. at the Goins Auditorium at Pellissippi State Technical Community College. This entry was posted in Start-ups and tagged business plan competition, Development Corportation of Knox County, Pellissippi State on May 5, 2010 by Roger Harris.